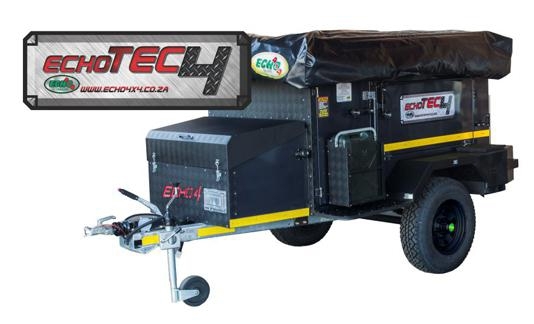 The Echo tec 4 Off-road trailer is an extreme off road camper and a step up from conventional off road trailers. It has found the perfect balance between loading capacity, weight, and functionality.Enhanced features, such as ample storage, dust sealing,100 litre water capacity, two options for the kitchen layout and weight distribution. A lockable nose cone provides excellent storage for a fridge/freezer unit. Additionally the Jerry cans are mounted to the outside of the trailer to free up more valuable space inside the trailer. This trailer is a reliable addition to the 4×4 enthusiast.It comes standard with a self braking axle to improve handling and also known for its comfort and easy towing. This makes it one of the ultimate campers to suit any wilderness adventure. Tried and trusted, The Echo Tec 4 remains a favorite for the serious outdoor explorer.